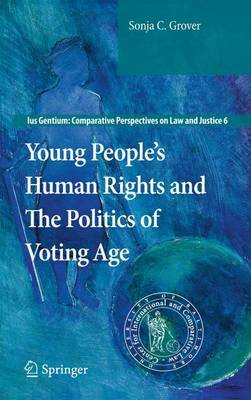 Young People's Human Rights and the Politics of Voting Age 2011 ed. The broader societal implications of voting age requirements is explored in this in-depth overview, in addition to the legislative bar against youth voting in North America and in Commonwealth countries. The text uniquely addresses the youth vote as a fundamental human rights concern. Young People's Human Rights and The Politics of Voting Age explores the broader societal implications of voting age eligibility requirements and the legislative bar against youth voting in North America and in Commonwealth countries (where 'youth' is defined as persons 16 and over but under age 18). The issue is raised as to whether the denial of the youth vote undermines democratic principles and values and ultimately the human dignity of youth. This is the first book to address the topic of the youth vote in-depth as a fundamental human rights concern relating to the entitlement in a democracy to societal participation and inclusion in influencing policy and law which profoundly affects one's life. Also examined are international perspectives on the issue of voting age eligibility. The book would be extremely valuable for instructional purposes as one of the primary texts in undergraduate or graduate courses on children's human rights, political psychology, political science , sociology of law or society and as a supplementary text for courses on human rights or constitutional law and would be of interest also to members of the general public concerned with children's human rights issues. Part III Voting Age Eligibility: Human Rights Issue or Social Policy Matter? 6.2.7 Ethnic, Color and Gender Discrimination in the Vote: Are They Analogous to Age-Based Restrictions on the Franchise? Sonja C. Grover, Ph.D., is a Professor with Lakehead University. She has authored over 80 refereed articles and has focused on the topic of human rights/children's rights publishing in leading international human rights and law journals. She has contributed two book chapters for a 2007 edited volume on children's rights in Canada and presented papers at various international conferences on the topic of human rights and vulnerable groups including at UNESCO. Dr. Grover is Associate Editor of the International Journal of Human Rights. She is also the single author of several books in the human rights field including: Children's Human Rights: Challenging Global Barriers to the Child Liberation Movement (Sandstone Academic Press, 2007); The Child's Right to Legal Standing (Lexis Nexis, 2008), Prosecuting International Crimes and Human Rights Abuses Committed Against Children: Leading International Court Cases (Springer, 2010) and The European Court of Human Rights as a Pathway to Impunity for International Crimes (Springer, 2010).